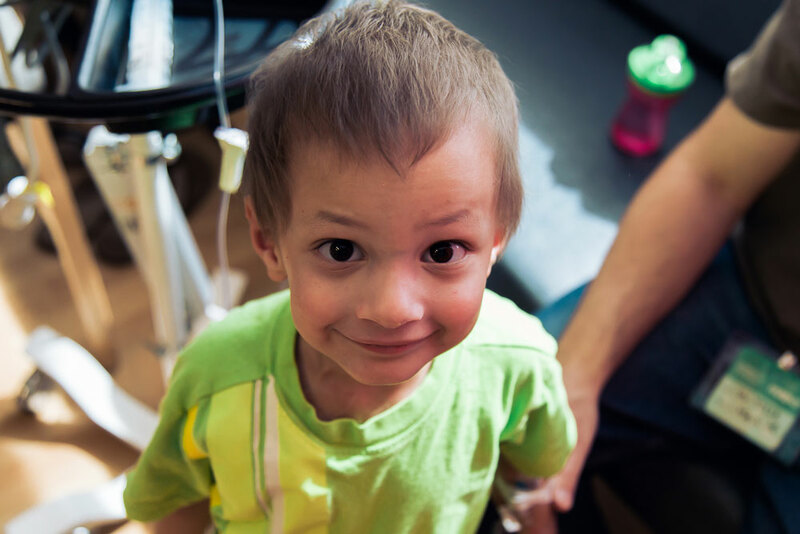 Honored Kid Micah is ready for his close-up during a hospital stay in 2015, when he was taking part in a St. Baldrick’s-funded clinical trial at Children’s Hospital of Los Angeles (CHLA) for neuroblastoma, a type of childhood cancer. For kids with cancer and their families, clinical trials mean hope. Clinical trials offer a chance for survival when all other options are exhausted. They offer kids in treatment and survivors the possibility of a better future with fewer side effects. Most of all, for all kids with cancer today and in the future, clinical trials help scientists get closer to cures. With your help, St. Baldrick’s has been an essential part of this lifesaving research phase since 2005 — every St. Baldrick’s donor has helped make these trials possible for more than 100,000 children with cancer. Before deciding on a course of treatment, the families of kids diagnosed with cancer are often given the choice to participate in a clinical trial. The goal of these trials is to find new treatments – or new combinations of treatments – that offer a better outcome for patients. Some are focused on helping the kid survive cancer, while others aim to improve the long-term health of those who survive. For childhood cancers, clinical trials are not the exception, they are the standard of care. Phase 1 trials enroll only a handful of patients – pioneers who are the first to receive a new drug or agent. These trials are usually available at a limited number of institutions and patients are studied very carefully. The primary goal is to see if the new treatment is safe. Phase 2 trials involve more patients and may be available at more institutions. Here, the goals are to see whether patients benefit from the new treatment and to learn more about potential side effects. Phase 3 trials are open to many more patients – sometimes hundreds or thousands – at more than 200 institutions across the U.S. and beyond. Here researchers are comparing the current standard of care to the new treatment to see which is most effective. When a Phase 3 trial shows that the new therapy offers better outcomes for patients, it will become the new standard of care. If a new drug or agent was involved, the trial can also result in FDA approval for the type of childhood cancer involved. 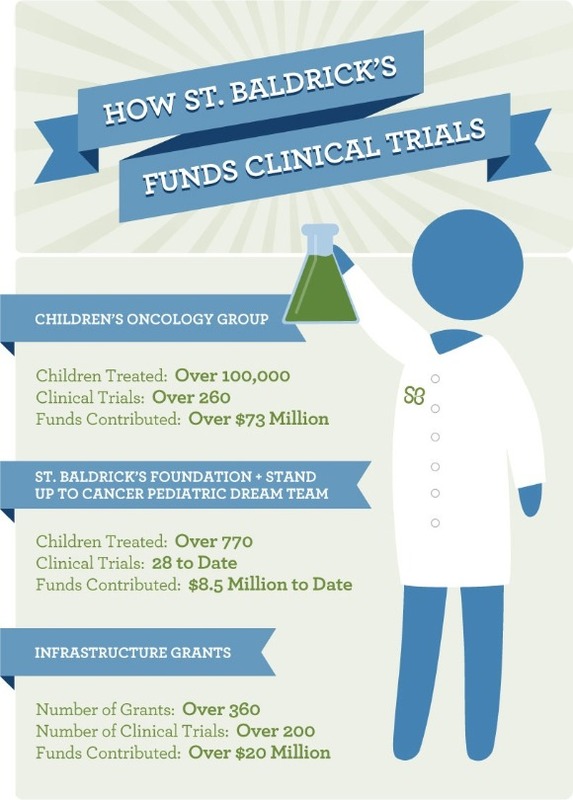 How does St. Baldrick’s support clinical trials? Donors to St. Baldrick’s support not only new discoveries, but also the clinical trials that bring discoveries from the lab across the finish line to help patients. Early phase trials are supported through many St. Baldrick’s grants to researchers or groups of researchers working in a consortium, while phase 3 trials are supported primarily through the Children’s Oncology Group (COG). More than 220 COG institutions are spread across North America, Australia, New Zealand and Europe. Through this cooperative research network, thousands of children have access to clinical trials. More than 100 trials are open through the COG at any given time. An annual grant from St. Baldrick’s to the COG provides each member institution with a per-patient reimbursement to help cover the costs of clinical trials. The average cost for a COG institution to treat a child on a clinical trial is $10,000. The U.S. National Cancer Institute reimburses $2,250 per patient, and the St. Baldrick’s Foundation adds another $1,000. Without these funds, far fewer children could be treated on trials and progress would slow significantly. Because of this support, trials are also more widely available. This means that more children can be treated closer to home, instead of being uprooted with their families to move closer to a major research institution. St. Baldrick’s also supports clinical trials by funding Clinical Research Associates (CRAs) at many institutions. These are the people who oversee clinical trials and make sure they are conducted exactly according to protocol. They make sure families understand everything involved in the treatment, collect and submit samples and medical records, and do the up-front work required to open new trials at their institutions. Some groundbreaking clinical trials – more than 25 to date – have also been supported through the St. Baldrick’s – Stand Up to Cancer Pediatric Dream Team. The Dream Team’s focus is to use genomics to identify and test new immunotherapy treatments. One of the most dramatic results of recent pediatric cancer clinical trials is Kymriah, the first gene therapy approved by the U.S. Food and Drug Administration, offering a cure to leukemia patients who had no other hope. But this progress isn’t made in a vacuum. Clinical trials are a team effort on a massive scale. They involve the researchers who make the discoveries, translate the science, and conduct the clinical trials, the staff who put the pieces into motion and make sure everything is running smoothly, as well as those kids with cancer and their families who choose to participate. But lifesaving clinical trials also need people like you. Since 2005, donors and supporters have made it possible for St. Baldrick’s to support this vital research, so all kids with cancer can have more treatment options and more hope for a long, healthy life – for them and for generations to come. Fund childhood cancer research and giving kids with cancer more treatment options. Donate today.